Once again, we hear from the Treasury Department hawking United States Savings Bonds. Rather than the usual musical guest or comedian, our guests are the cast of a popular radio drama. 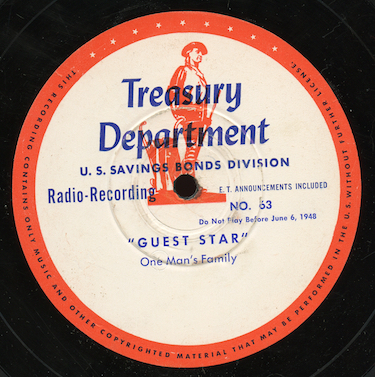 Program #63, dated June 6, 1948 on the label, features the cast of “One Man’s Family” in a short sketch where son Paul makes a speech for US Savings Bonds. The announcer is David Ross. Our show was dubbed direct from an original Treasury Department vinyl transcription, matrix number D23995B. And now, another previously lost episode of "When a Girl Marries", that daytime drama “dedicated to everyone who has been in love” from the creator of “Pepper Young’s Family” and “Rosemary”. Check my post last week for another episode in the series from the other side of this disc. In the episode of May 6, 1954, Harry hires a private investigator to check out the mysterious goings-on with Joan’s mother. The program is sponsored by Friskie’s dog food (made from US government inspected horse meat!). Our cast includes Mary Jane Higby and the announcer is Wendell Niles. The show was directed by Warren Somerville. This appears to be previously lost. The program was transferred to digital from an original ABC radio network lacquer. Our thanks to blog listener William Harris for the disc! Researcher Joseph Webb, by the way, sent along this interview with Warren Somerville. Joseph met him in 1977. He was still working at ABC and the interivew was originally published he OTR fanzine Airwaves #5 - March 1977 issue. 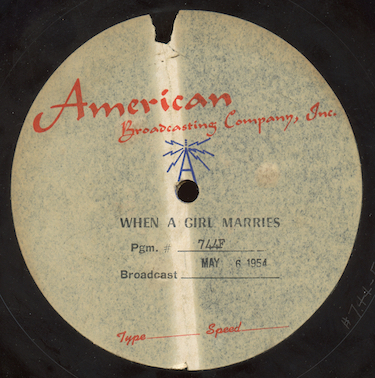 “When a Girl Marries”, a continuing drama about young married life and “dedicated to everyone who has been in love”, was a constant presence on daytime radio from 1939 to 1957, running at one time or another on all three networks. It was created by Elaine Carrington, who was also responsible for “Pepper Young’s Family” and “Rosemary”. The episode of May 4, 1954, numbered 742F in the series, involves some mysterious goings-on with Joan Davis’s mother. The show was sponsored by Friskie’s dog food. Featured in the cast is Mary Jane Higby, author of a wonderful memoir about her work in radio. The director is Warren Somerville. The announcer is Wendell Niles. Despite the long run of the show, it appears that only fourteen episodes of the series are circulating and this appears to be a previously lost program in the series. Our thanks to blog listener William Harris for the disc - check the blog next week to hear the episode on the other side of the disc. And now another episode of the obscure soap opera, “Linda’s First Love”. As I mentioned last week, the program was syndicated for eleven years, from 1939 to 1950, but only a handful of the shows seem to survive. Program 3386 was on the air on January 20, 1950. Danny doesn’t believe that Elaine is in love with him and has gone away to forget. Your sponsor for the show is Kroger’s Spotlight Coffee. This appears to be another previously lost episode of the series. The show was produced by the Ralph H. Jones Company. Our mp3 was transferred from an original sixteen inch red vinyl Muzak transcription disc. 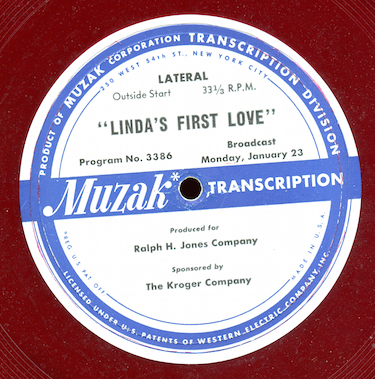 Finally on the blog this week, an almost forgotten syndicated daytime soap opera, “Linda’s First Love”. Despite being a program syndicated on disc during the prime years of old time radio, on the air from 1939 to 1950, only less than ten episodes of the series circulate among collectors. What happened to all those discs? 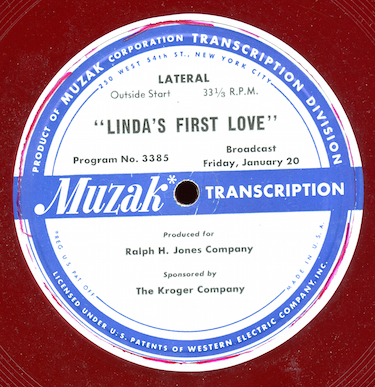 Program 3385 was originally heard January 20, 1950. Linda and Danny rush to the train depot to find out why Elaine is suddenly leaving. Is she really in love with Danny? The show is sponsored by Kroger’s Spotlight Coffee. This appears to be a previously lost episode of the series. Next week, another previously lost episode of the series from the other side of the disc. Here's the only other episode in my collection of "Boulevard of Make Believe", a syndicated serial drama about Hollywood stars featuring Anna Q. Nelson and Viola Dana. In program 12, Wally talks to the police about how he might be mixed up in the kidnapping of his wife. The end theme plays through and we hear a male vocalist crooning the lyrics to "Boulevard of Broken Dreams" - he sounds a bit like Bing Crosby. Anyone have an idea who it might be? It wasn't uncommon for these early 30s syndicated shows to use cues from commercial records, so it might be from a commercially released 78. Dave Goldin, by the way, lists program 1 in the series in his database, a show which ran in my blog a few months ago. He conjectures that one of the performers playing a Mexican sounds like Bela Lugosi. What do you think? 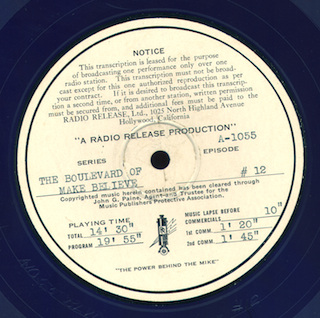 The show was digitized direct from an original shellac Radio Release Productions transcription disc, matrix number A-1055. Radio Release Productions, you might recall, also produced the "Police Reporter" series I ran on the blog awhile back. I wish I could run into the full run of the series, which I'm guessing was just 13 or 26 episodes - this sounds like a fun serial. My special thanks to the Old Time Radio Researchers Group for adding this disc to my collection! Earlier, we ran a rare early 1930s series in the blog, "Police Reporter", syndicated by Radio Release Productions. Here's a another program the company produced, "Boulevard of Make Believe". A "behind the scenes" Hollywood drama serial, the show features Anna Q. Nelson and Viola Dana. In program 1, Nelson gives advice to a new starlet, Betty. Dana talks with Anna about Wally, a married man who is in love with Anna. Anna is approached by a publisher about her memiors, but, strangely, she hasn't actually written them. The disc I have contains this show and program 20 in the series and I haven't found out much about it or the company that produced it. The program was dubbed direct to digital from an blue Flexite Radio Release Productions transcription, matrix number A-1029, probably pressed by Columbia. My special thanks to the Old Time Radio Researchers Group for adding this dic to my collection! 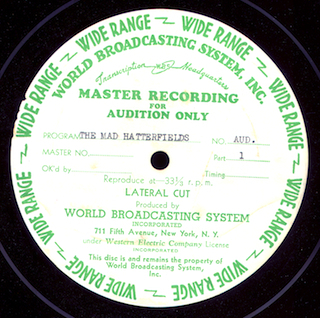 In this post, a half-hour audition for potential sponsors of the show "The Mad Hatterfields". Previously broadcast as a quarter-hour serial on WLW-Mutual, this was an attempt to turn the show into something for an evening slot. Announcements during the show highlight different aspects of the talent involved in the series and the show's run as a fifteen minute feature. In the dramatic portion of the show, Edward arrives and is introduced to the different characters in the eccentric Hatterfield family. A small group of strings and piano are used for the music, rather than the solo piano used in the fifteen minute version of the series. The show, perhaps dating from circa 1939-40, was transferred from an original World Broadcasting two-sided lacquer. 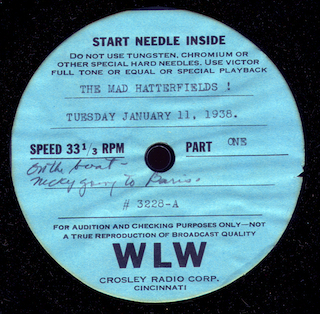 The "Mad Hatterfields" is a rather obscure fifteen minute serial from the 1930s originating at WLW in Cincinnati. The program was written by Pauline Hopkins, whose other credits include radio's "First Nighter" and "Grand Hotel" and who played Meg on "The Mad Hatterfields". The show was directed by Owen Vinson, later the director-producer of "Let George Do It". The show is a fun serial that looks at an eccentric theatrical family. The matron of the clan, Mama Hatterfield, struggles with her "glory days" being in the past; her brother Rolly is a pompous, free-spending thespian; one daughter who is flighty and falls in love with any man coming along while the other level-headed daughter tries to keep everyone in line. I have eight episodes from the series on original WLW laquers from 1938 and 1939. No other programs appear to survive in private collections or archives and it's never been circulated among old time radio collectors to my knowledge. The discs came from the collection of Marty Halperin, the vice president of the Pacific Pioneer Broadcasters. I think these transcriptions only survived because they were used to assemble an audition disc for the series as a half-hour situation comedy. (You can hear that audition in the next post.) The discs included a handwritten sheet of notes on the different shows and the discs have some groove wear, indicating they were played several times as they prepared the audition show. The program of January 11, 1938 has Nicki calling off his engagement with Meg and sailing for Paris. Meg and the whole Hatterfield clan have rushed to the boat to find him. Can Meg convince Nicki to stay and marry her? The show is sponsored by Nestle's Lion brand irradiated evaporated milk. The aives WLW id and states "This is the WLW line to New York." A helpful blog listener dug up some infomration from newspapers on the show. 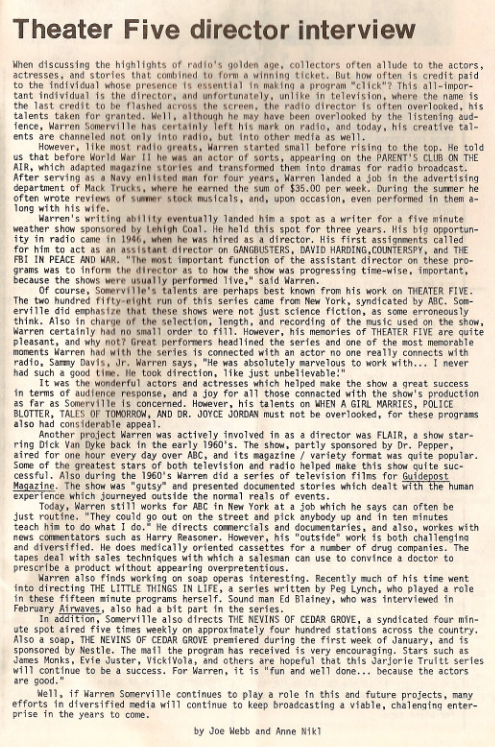 Mutual sent out a press release on July 3, 1938, noting that the program would premiere on Monday, June 27 from 4:45 to 500 pm. The release also noted that "Midstream", a more serious serial, would premiere on the same date and was also written by Pauline Hopkins. "A MILLION WORDS WRITTEN FOR ONE RADIO PROGRAM For her 370 episodes of the “Mad Hatterfields,” Pauline Hopkins, author of the popular Mutual network serial, has written approximately 1,036,000 words. At 2,800 words per script, which in itself is above the average for air-dramas, but which is the result of an unusually fast pace set by the comedy, Miss Hopkins’ wordage is believed to be a near record. The author of “Mad Hatterfields” began writing at the age of seven, but gave up all hope of ever becoming a writer when her first novel, “The Scarlet Goods,” written before she was ten, brought nothing but hilarity from her family. Gathering material for her radio-drama, Miss Hopkins turns an eye to the members of her own family, and writes a story of artistic and lovably erratic people. “The Mad Hatterfields” originates in the studios of Mutual’s Cincinnati affiliate,, WLW, and is heard Monday through Friday at 3:45 p. m. over KBST." 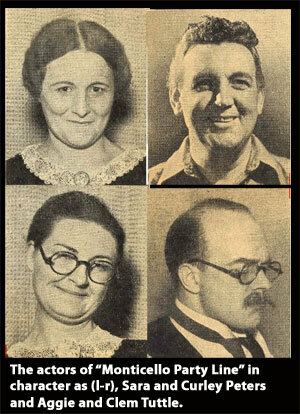 A newspaper publicity photo from June 6, 1939 identifies some of the cast - Rolly was played by William Green, Meg by Pauline Hopkins, Nicky was Duane Snodgrass and Rita was portrayed by Betty Arnold. 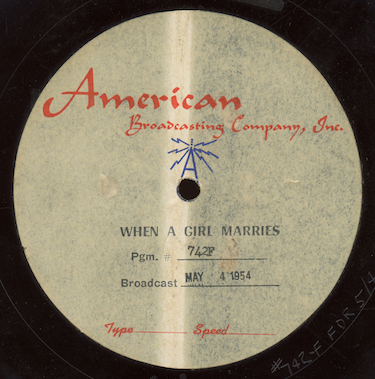 Before airing on Mutual, the show appears to have been heard locally in July 1937 on WLW and left the air around June 1939. Our mp3 was transferred direct from an original WLW lacquer. It is previously uncirculated among otr collectors. Since our run of "American Family Robinson" is at an end, I'd like to introduce you to a new series we're starting, "Monticello Party Line". The show isn't very well documented, so I'm hoping some of you might be able to dig up some info on it beyond what I found on the web as we go through our run. I've got 43 episodes and I'll be posting two per week over the next few months. In addition, I'll be posting at least two of the recipe books offered as a mail-in premium on the series. Sponsored by Dr. Caldwell's Syrup Pepsin, a patent laxative, "Monticello Party Line" was a soap opera based around the small-town lives of Monticello, Illinois, the location where the Dr. Caldwell company was headquartered. (Goldin, by the way, in his listings for two episodes of the series, incorrectly conjectures that the setting might be Monticello, California.) The program is based around a telephone "party line", though the actual party line itself is only used as a plot device on occasion in the episodes. The stories revolve around the problems of couples Curley and Aggie Peters and Clem and Sara Tuttle and people in the town. At times, the show sounds like it was influenced by character driven comedy serials, like "Vic and Sade" or "Lum and Abner", and, with other characters moving in and out of the town, more of a traditional women's soap opera. The show offered as a mail-in premium, a recipe and household tips book supposedly authored by Sara and Aggie that featured photos and information on the town and characters. Some shows, like the set in my collection, have other offers for household items like aprons. Often, characters participate in the show's commercials or Syrup Pepsin or one of the mail-in premiums are mentioned in the context of the show's dramatic sections. The series was produced by the Cramer-Krasselt Company advertising agency in Milwaukee, Wisconsin. The agency is still in business today with clients such as Corona, Corelle, and Career Builder - quite a distance away from patent laxatives. "Monticello Party Line" was, oddly enough, written by Sandra Michael, who would go on to create "Against the Storm", the only radio soap to win a prestigious Peabody award in 1942. "Against the Storm" was known for it's more literate, intelligent quality - Poet Laureate John Masefield was once a guest on the program via a special shortwave link and Edgar Lee Masters guested and read from "Spoon River Anthology". The show tackled big topics like pacifism and the war in Europe and Michael strongly felt that housewives needed something with more depth than the typical dramas on daytime radio. According to Dunning, President Roosevelt was scheduled to be a guest on the show in December 1941, but he was a bit busy with Pearl Harbor and had to cancel. With the integrated sponsor messages and typical soap opera storylines, I can imagine Sandra leaving "Monticello Party Line" in the late 30s, falling to her knees and declaring "I'll never shill for patent laxatives again!" as she looked for a more high-class outlet for her writing talents, though I'm not sure what Micheal really thought of the series later. For me at least, the 43 episodes were charming and inventive in their own way, a real glimpse of a lost era in broadcasting and of laid-back small town life with gossipy eccentric neighbors. "Monticello Party Line" was syndicated to local stations that would typically the program five days per week in the morning or mid-morning soap opera block alongside shows like "Just Plain Bill", though I've seen some program listings for it in the late afternoon/early evening block. Internal references in the show indicate it might have been heard as early as 1934 or 1935. The Chicago Tribune first lists it in January 1936. The first reference to the program in the Los Angeles Times is the schedule for September 22, 1936 and the last is in 1937. There are no references to the program on radio schedules in New York or Washington, so it probably ran on smaller market stations or perhaps regionally in the West and mid-West where Syrup Pepsin was distributed. The Broadcasting Yearbook mentions the program as late as 1939. The dates for the shows I'll be posting come from pencil notations on the labels, verified with a 1938-39 calendar and internal references to days of the week and holidays in the show. The series was broadcast without interruption through program 675, broadcast in March, 1938. At that point, the program went on a summer hiatus and picked up that fall where it left off a couple of months before. My run of the series includes this break, and the show helpfully includes some introductions to the characters and plot for listeners that might be tuning in for the first time. "Monticello Party Line" might have gone off the air because of difficulties faced by the Dr. Caldwell company. Bottle collectors are very familiar with the product and both the sample size and full-size retail bottles are quite common on the market. One collector site cites a March 14, 1939 NY Times article reporting that the Federal Trade Commission clamped down on the company for its claims for Syrup Pepsin. The city of Monticello has a page outlining a history of the company and you can see an original document on the FTC case against Syrup Pepsin. I noticed in looking at some of the original bottles and packaging online that Syrup Pepsin contained 4% alcohol "to prevent freezing", so perhaps if you were a regular user of Syrup Pepsin, consuming it in the way it's hawked on the radio show, you might not have really cared if you're regular or not. One of the cookbooks offered as a premium on the show even suggested Syrup Pepsin as an ingredient in a recipe. Only a handful of random examples of "Monticello Party Line" are currently in circulation among collectors so it's been difficult to get a feel for what the series was really like. All but two of the programs I have are previously uncirculated and, since they date from the same period, give you a good sense of what the show sounded like day-to-day. I'm missing some shows here and there, but the plot moves at such a glacial pace that you can still keep up with the story pretty easily. I'm doubtful that a full run of the series will turn up unless it's scurried away in some archival or personal collection of a company or personality connected with the show. 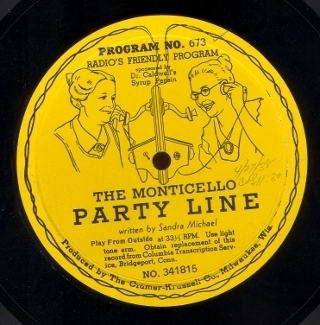 Unlike other syndicated shows that might be re-run over many years, "Monticello Party Line" was intended to be broadcast only once, so there was no incentive to keep the transcriptions after they were heard on the air. For our first post, let's take a listen to program 673 in the series, originally broadcast April 27, 1938. Clem and Curley talk about a mysterious new woman that's arrived in town with David Hunter. Meanwhile, Carlton Ross and his sister, the mysterious woman, inspect the old Brewster house with David. The show was transferred from an original Flexite transcription pressed by Columbia, matrix number 341815. The date is noted in pencil on the label. Copyright &copy; 2011 Randy Riddle. All rights reserved.